سعداله زاده, بهنام, اسماعیلی, مرتضی, ذاکری, جبارعلی. (1396). تعیین سختی برشی قفل‌شدگی لایه‌های بالاست به روش آزمایشگاهی. نشریه انجمن زمین شناسی مهندسی ایران, 10(شماره 3 و 4), 69-82. بهنام سعداله زاده; مرتضی اسماعیلی; جبارعلی ذاکری. "تعیین سختی برشی قفل‌شدگی لایه‌های بالاست به روش آزمایشگاهی". نشریه انجمن زمین شناسی مهندسی ایران, 10, شماره 3 و 4, 1396, 69-82. سعداله زاده, بهنام, اسماعیلی, مرتضی, ذاکری, جبارعلی. (1396). 'تعیین سختی برشی قفل‌شدگی لایه‌های بالاست به روش آزمایشگاهی', نشریه انجمن زمین شناسی مهندسی ایران, 10(شماره 3 و 4), pp. 69-82. سعداله زاده, بهنام, اسماعیلی, مرتضی, ذاکری, جبارعلی. تعیین سختی برشی قفل‌شدگی لایه‌های بالاست به روش آزمایشگاهی. نشریه انجمن زمین شناسی مهندسی ایران, 1396; 10(شماره 3 و 4): 69-82. پدیده قفل­شدگی برشی بین لایه­های بالاست­ قرارگرفته در زیر تروارس­های مجارو هم، در اثر بارگذاری محوری و با وجود سه عامل ضخامت زیاد لایه بالاست، زاویه توزیع تنش بزرگ در توده بالاست و کم بودن فاصله بین تراورس­ها رخ می­دهد. تحت این شرایط و با فرض انتقال بار در داخل توده­های بالاست به صورت یک توزیع تنش هرمی، یک همپوشانی بین هرم­های مجاورهم ایجاد می­شود که موجب بسیج شدن یک سختی و میرایی مضاف بر سختی و میرایی لایه بالاست در راستای قائم می­شود. این دو پارامتر کوپل برشی نامیده می­شوند. تاکنون در تحقیقات اندکی به مطالعه این پارامترها پرداخته شده است از اینرو در این مقاله با هدف ارزیابی سختی برشی بالاست در ناحیه قفل­شدگی، با توسعه یک روش آزمایشگاهی، آزمایش­های برش بالاست تحت سربارهای استاتیکی ۲۰۰، ۳۰۰ و ۴۰۰ کیلوگرم و در تراکم نسبی ۷۰ درصد صورت پذیرفته است. همچنین اثر مقادیر تراکم نسبی ۴۰ ،۷۰ و ۹۵ درصد نیز بر میزان مقاومت برشی بررسی شده است. برای انجام آزمایش­ها یک دستگاه برش بالاست بزرگ مقیاس در آزمایشگاه روسازی راه­آهن دانشگاه علم و صنعت ایران ساخته شده و مورد استفاده قرار گرفته است. بر اساس نتایج بدست­آمده، برای تعیین پارامتر سختی برشی قفل­شدگی لایه­های بالاست، یک مدل ریاضی چهار پارامتری که در برگیرنده بارمحوری، وزن مخصوص لایه بالاست، سرعت قطار و قطر چرخ قطار می­باشد توسعه داده شده است. Ballast shear interlocking is phenomenon that occurs between adjacent ballast masses under sleepers due to axial loading. This phenomenon is caused when three factors: 1) large thickness of the ballast layer, 2) large stress distribution angle at ballast mass of under sleeper, 3) small sleeper spacing are available at ballasted track. Thus, despite these three factors together and based on the assumption of transfer load from sleeper into ballast mass in accordance with a stress distribution pyramid, caused an overlap between two adjacent pyramids that this intersection would mobilize shear stiffness and shear damping in addition to stiffness and damping ballast layer in the vertical direction. This stiffness and damping is called the shear coupling. Considering the fact that so far, few studies have investigated about these parameters, but the method for calculating them is not provided in the technical literature. 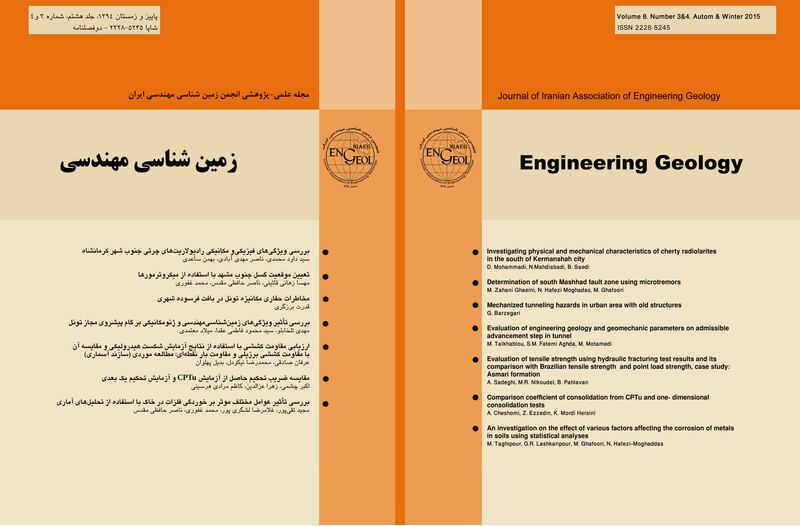 Therefore, in this research by developing a laboratory method in order to determine the ballast shear stiffness parameter and shear strength, shear tests of ballast in the vertical direction in the locking zone under static overheads 200, 300 and 400 kg in the relative density is 70.95% done and the effect of relative densities of 40, 70 and 94.44 percent on the shearing of the ballast is investigated. For this purpose, a device for shear of ballast in Railway Superstructure Laboratory of the railway engineering school was designed and built. Finally, based on the results and the integrate them, in order to use the results a mathematical relationship for ballast shear stiffness parameter has been determined which includes the axial load and vehicle speed and high density relative of the ballast. Timoshenko, S., 1926. Method of analysis of statical and dynamical stresses in rail. In Proc. Second Int. Congress of Appl. Mech., Zurich (pp. 12-17). Lackenby, J., Indraratna, B., McDowell, G., & Christie, D., 2007. Effect of confining pressure on ballast degradation and deformation under cyclic triaxial loading. Géotechnique ,57 (6) (2007) 527–536. Guoqing, J., Guixian, L., Yang, X., & Jiong, Z., 2014. Micro-analysis of sub-ballast direct shearing under normal stress. Computer Model & New Technologies, 18(2) 70-75. Wang, Z., Jing, G., Yu, Q. and Yin, H., 2015. Analysis of ballast direct shear tests by discrete element method under different normal stress. Measurement, 63, pp.17-24. Esveld, C., De Man, A., 2003. Use of railway track vibration behavior for design and maintenance. In IABSE Symposium Report (Vol. 87, No. 5, pp. 39-45). International Association for Bridge and Structural Engineering. Huan Feng, H., 2011. 3D-models of Railway Track for Dynamic Analysis. Stockholm. Zakeri, J. A., Xia, H., Fan, J. J. ,2009. Dynamic responses of train-track system to single rail irregularity. Latin American Journal of Solids and Structures, 6(2), 89-104. Ishida, M., Suzuki, T., 2005. Effect on track settlement of interaction excited by leading and trailing axles. Quarterly Report of RTRI, 46(1), pp.1-6. Ahlbeck, D. R., Meacham, H. C., & Prause, R. H., 1975. The development of analytical models for railroad track dynamics. In This article is extracted from Symposium on Railroad Track Mechanics, RRIS 01 130826, Publication 7602. The complete volume is $3.75, Microfiche $2.25. (No. 76-TR-1). Ripke, B., Knothe, K., 1995. Simulation of high frequency vehicle-track interactions. Vehicle System Dynamics, 24(sup1), 72-85. Oscarsson, J., Dahlberg, T., 1998. Dynamic train/track/ballast interaction-computer models and full-scale experiments. Vehicle System Dynamics, 29(S1), pp.73-84. Igeland, A., J. Oscarsson, J., 1997. Modelling of railwaytrack for computer simulation of dynamic train/track interaction, in: Proceedings of 15th International Model Analysis Conference, pp. 464–470. Zhai, W. M., Wang, K. Y. , Lin, J. H., 2004. Modelling and experiment of railway ballast vibrations. Journal of sound and vibration, 270(4), 673-683. Oscarsson, J., 1999. Dynamic Train/Track/Ballast Interaction–Linear and State-Dependent Track Models, Licentiate Thesis, Chalmers Universityof Technology, Goteborg. ASTM C136-06, 2006. Standard Test Method for Sieve Analysis of Fine and Coarse Aggregates, ASTM International, West Conshohocken, PA, “Roadway and Ballast”. ASTM D4254-00, 2000. Standard Test Methods for Minimum Index Density and Unit Weight of Soils and Calculation of Relative Density, ASTM International, West Conshohocken, PA.
ASTM D4253-14, 2000. Standard Test Methods for Maximum Index Density and Unit Weight of Soils Using a Vibratory Table, ASTM International, West Conshohocken, PA.
American Railway Engineering and Maintenance of Way Association (AREMA), 2006. Manual for Railway Engineering, Volume 1, Chapter 1.